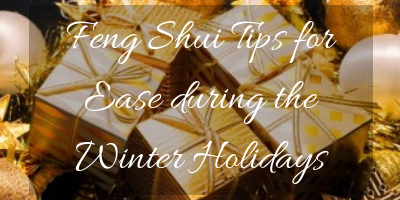 Feng Shui (pronounced fung schway), when good, creates a feeling of harmony and love in our homes for the holidays. Negative Feng Shui can contribute to a feeling of disconnection, tension, and feelings that are less than peaceful. A great Feng Shui holiday intention would be to create a feeling of open, flowing energy, harmony, and helping people feel comfortable in your home. Holidays are when friends and family come together to enjoy good food, family traditions, gift giving, and celebration. Decorating for the holidays is great Feng Shui, as the lights, greenery, sparkling decorations, and color all bring attention and energy to the home. The Fire Element (Chinese Five Elements) brings passion and energy, and triangles are symbolic of the fire element. Wherever you place the Christmas tree, which is a triangular shape, will bring the fire element. It is best to place the tree a bit away from your seating areas, as this will keep conversations from being too intense! A tree decorated in red and gold will bring happiness and harmony. The menorah with candles is also symbolic of the fire energy in Feng Shui. Lighting up your entry way creates a welcoming feeling. Decorating plants with small lights brings good energy as well. The front door is the largest opening or mouth of Chi’ in the home. Placing a lighted garland around the front door will bring more energy to your home. If you are using an artificial tree, a scent of spruce or pine will trigger the memories of a real tree and other holiday memories. Peppermint essential oil energizes and cleanses the air. Cinnamon essential oil has a spicy fragrance that is warming, helping to focus the mind, working as a tonic giving you energy and strength during the holidays. Shopping, decorating and cooking takes energy! Frankincense essential oil has a deep religious connection, is relaxing, and is wonderful to soothe and calm children and adults. It is used in many religious ceremonies and celebrations during the holiday season. The dining room is a place of wealth, and holidays are a time to bring out the good china, table coverings, beautiful serving dishes, and cloth napkins. Centerpieces with color, glitz and fresh fruits create a feeling of abundance. A large mirror placed in the dining room, reflects the joy and feeling of wealth. Placing small dishes of nuts and candies, offers a feeling of abundance. In Feng Shui, children, animals and music are considered lifters of energy/chi. Music creates joy, and happiness. Whenever I am doing an open house in real estate, I clear the house with aromatherapy before the public arrives, have my I-pad playing background music, and always have snacks. People say my open houses feel like a party. Yes, my open houses create an inviting atmosphere and people feel it when they enter the house. Your home is often at its best during the holidays, with sparkles and glitz combined with family treasures. Emotions are part of buying a home, and when a home is decorated with taste and is clutter-free, people feel the joy. They can imagine their family celebrating their holidays next year in this space. There is also less competition during the holidays. There is a home shortage in the USA right now. When home inventory is low, more buyers will appear. It is worth the inconvenience of having to leave your home for the home showings by your real estate agent! The holidays are a wonderful time to attend a holiday event with friends and family. Instead of gift giving with friends, suggest attending a theater performance or musical performance as your gift to each other! I will be seeing “Anastasia” at the fabulous Fox Theater in St. Louis with my three children the night after Christmas this year! Wonderful memories are created when planning the holiday fun with Intention. Enjoy the holidays, and remember to keep space open for wonderful surprises. Create beauty and harmony, and open your heart to love in a whole new way. HAPPY HOLIDAYS!